A Chanel inspired ensemble in black and white, this fashion consists of a gown and cropped jacket. The gown has a dropped waist, strapless bodice in white silk, highlighted with fine black grosgrain bands at the waist and under the bust. 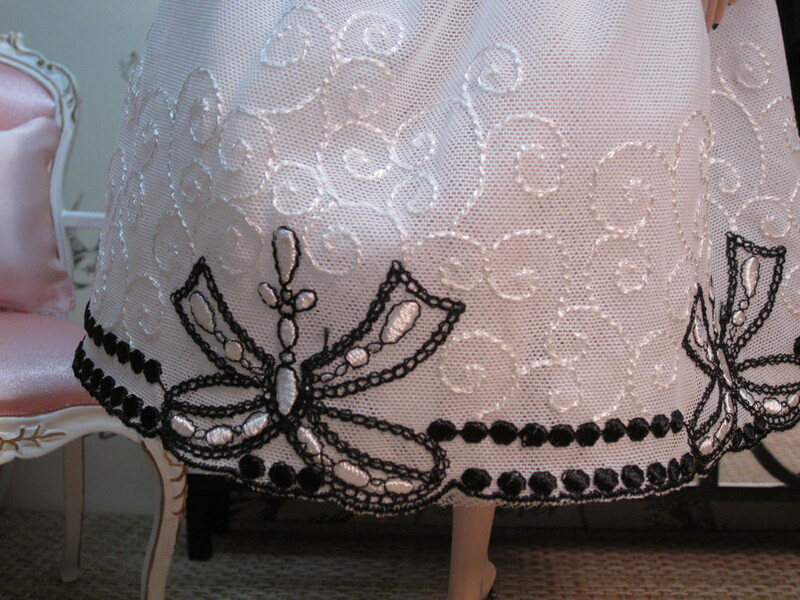 The full skirt is multiple layers of stiff white net with an overlay of fine white tulle embroidered with black bows and white swirls. The cropped jacket is made of black organza roses and fully lined in black organza. Pearl accents are hand sewn in the center of assorted roses. Pink and White French Baroque Chair, Rebecca Berry. Mirrored Console, Welcome Home.